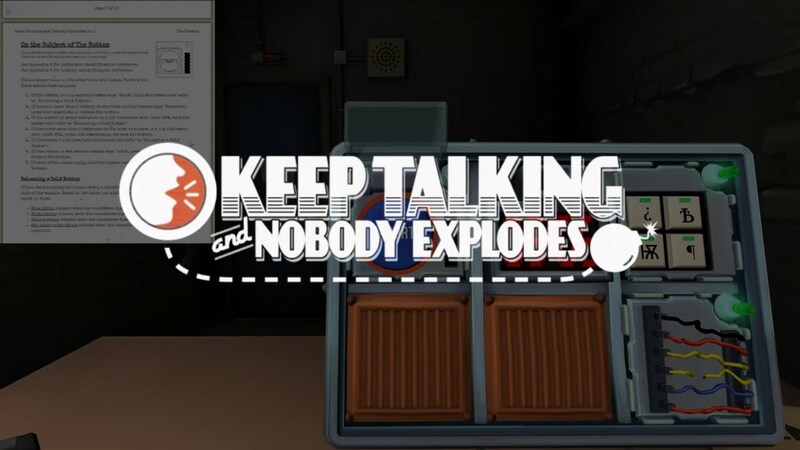 After my brother and I played Keep Talking and Nobody Explodes at PAX last year we knew we would absolutely need to play it when it released on PC. I picked it up right when it launched because it was fairly inexpensive and it sat unplayed on my computer until last week. We finally got around to playing and it was super fun. I was the bomb deffusal player and he had the bomb manual. As we got into more and more complicated ones to defuse he ended up spreading out every page of his printed out manual on a table so he wouldn't have to flip pages. We also started using shorthand verbal cues to identify different modules and patterns. It's a game all about communication and it worked super well over headset. If you aren't familiar with it, the player in the room with the bomb isn't allowed to look at the manual and the manual player isn't allowed to see the screen with the bomb. It's asymmetric and it's kind of amazing. You should take a look at the Bomb Manual to see what it is that player is dealing with. I didn't take a look until we finished our play session that night and I was super impressed with my brother's ability to parse the manual and get me the information I needed. The other thing that I would love to try is more than two players. I've seen other people do it on streams. Basically, you still have one person interacting with the bomb, but you can have any number of people on the side with the bomb manual. Each one can be in charge of different modules and it can be a team effort. If you have a friend that plays games and you have fun communicating with I highly recommend Keep Talking and Nobody Explodes. It's a great game.